A pina colada on the rocks cocktail made from fresh muddled pineapple, cold pressed pineapple juice, and coconut cream. 1/2 cup fresh pineapple , chopping it small will help when you muddle it. To make the toasted coconut, throw a 1/4 cup of coconut into a pan on medium heat. Toast until it gets nice and brown then take it off the heat. Watch it closely as it can burn quick if your not careful. Muddle your pineapple in a martini shaker. Add the rum, the pineapple juice, and the coconut cream. Shake it well. 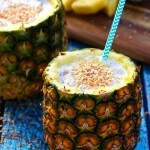 Fill a glass or a cored out pineapple 1/2 way with crushed ice. Pour the cocktail mixture over the ice, top with toasted coconut and enjoy! If you are filling a pineapple with this cocktail, you may have to double the recipe. Depending on how big your pineapple is.